Wine Review: Pelee Island Winery “Secco” (Prosecco) | Wine Splash! Daisy gives this sparkler 4 out of 5 Paws! We enjoy visiting wineries and drinking wine from all of the Great Lakes Region! And Canada is no different. In fact, from where we live in Southeast Michigan, Canada is actually our closest wine region. We recently visited one of the largest Canadian wineries called Pelee Island Winery and they produce an excellent amount of quality, flavorful wines! One of our favorites is the Pelee Island “Secco” sparkling wine which is made in the Prosecco style! Light bubbles, very fruity, festive, and fun! On sight, this sparkler is a daybright yellow and clear. On the nose, nuances of tropical fruit, apple, and citrus fill the glass and our senses! A promise of good things to come! On the palate, the wine is medium weight, small bubbles, and soft. Flavors of pear, Macintosh apple, tropical citrus, and even a hint of peach. The finish had a nice length which shows good acidity. We had this “Secco” on our deck after a long day at work so it was perfect to balance the day out. We would consider this prosecco an Extra Dry style since there was a hint of sweetness from all the ripe fruit. We would pair this with a mild cheese, seafood, salads, or as an apertif. We give this Pelee Island Winery “Secco” an 88 point rating based on its fruit forwardness, nice bubbles, and good acidity. It is a nice sparkler for light apertifs and for festive get togethers! We enjoyed it on the deck in the sun but we feel it would bring out sunshine on a cloudy day! 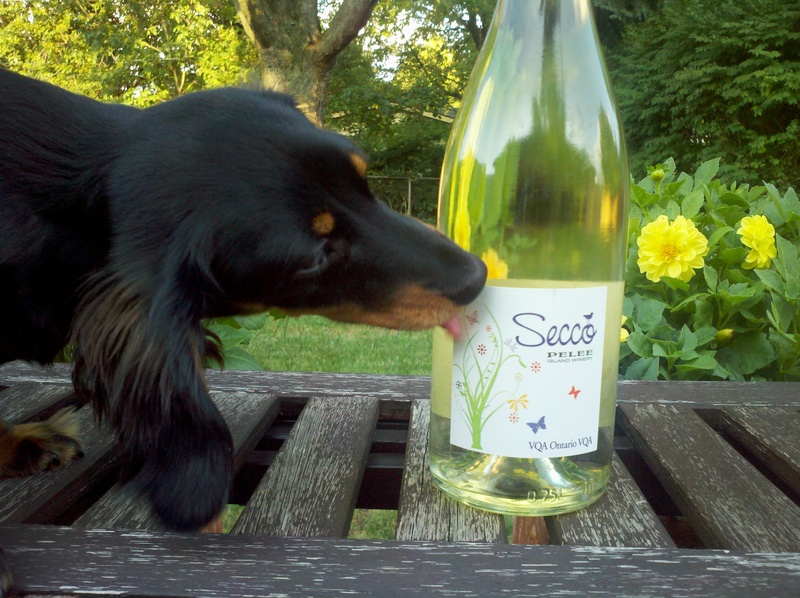 Our Wine Dox Daisy gives this wine 4 Paws out of 5 Paws! A fun thing we usually do is after we have a glass of prosecco, we fill our 2nd glass with fruit like blueberries, raspberries, or peaches and just let them soak up the Prosecco. It makes a wonderful, bubbly concoction with a fruit healthy finish. WineSplashing! !